That's No Moon! Did Russia Deploy An Experimental Killer Satellite? 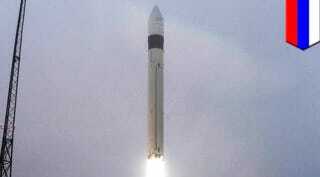 Russia launched the Kosmos 2499 rocket mission back in May as part of what seemed like just another mission to further develop its constellations of 'Rodnik' communications satellites. Usually three satellites are released during these missions, but this one had a fourth object. The U.S. thought that this strange radar return was just debris, but not so much anymore. According to the BBC, Russia told the UN that the piece of debris in question was actually a fourth satellite, which in itself is nothing too odd, as the US launches classified payloads all the time. Additionally, Russia has been all about surprises lately, so it was seen as just another question thrown on top of a pile of questions. But then satellite observers saw the craft changing its orbit in ways that are far from normal for even spy satellites that usually do anything they can to conserve their finite fuel. On November 9th, this small satellite's odd maneuvers came to a head when it actually approached a piece of the rocket that sent it into space nearly six months earlier, maneuvering within just meters of it. Could this be Russia's answer to technologies that are clearly being developed by the US on multiple levels, including one of the potential missions for the Air Force's shadowy pint-sized space plane, the X-37B? Unofficially termed 'inspector satellites,' these are basically maneuverable space vehicles that can approach other satellites for both passive and potentially active purposes. On the passive side of things, these space drones of sorts can observe the design of a satellite, taking photos and laser measurements of it, and in some cases, they can even listen to the targeted satellites transmissions. On the active side of things, this capability could be used to refuel or even repair other satellites in orbit. Then there are the darker sides of the 'active' mission, with the potential of possibly blinding, jamming or even kinetically destroying enemy satellites during a time of hostilities. The idea of one satellite manipulating, or even 'shooting down' another is nothing new, with the Soviets designing cannons into their Salyut 3 and Almaz orbital platforms during the Cold War. Additionally, multiple anti-satellite satellite systems were also proposed during the Reagan era 'Star Wars' initative. Yet today, almost 25 years since the end of the Cold War, we are finally and quietly facing the stark possibilities of this whole new dimension of warfare. In which, extra-atmospheric drones can potentially take an enemy's most sensitive eyes and ears, as well as their most advanced form of communications, away, seemingly without warning. Russia is not alone when it comes to foreign powers that appear to be wading into this new dimension of warfare, with China being rumored to also be testing manipulation, 'rendezvous' and dynamic maneuvering satellite capabilities that clearly have 'dual use' potential. Beyond the question mark that is the X-37B program, DARPA has had some eyebrow raising initiatives recently that could clearly be 'soft' covers for programs aimed at orbital dominance. The Phoenix program in particular is of great interest. Under this program a 'tender vehicle' with arm like appendages that can dynamically maneuver in orbit would capture derelict space junk, such as old satellites with communications dishes. It would then attach a small 'satlet' to that abandoned piece of hardware that would provide power and the brains for the re-purposed said space junk. In effect, this would save money as you could launch a tender vehicle with dozens of satlets for the cost of a single new-build communications or listening satellite or two. This all sounds nice, but clearly Phoenix has as many offensive implications as it does economical ones. That same tender vehicle loaded with satlets could also potentially have its way with enemy spy and communications satellites, attaching themselves in an attempt to tap into the enemy's orbital hardware or to lay waiting for the right time to strike. If successful, such a 'parasitic' systems could take enemy satellites offline at just the right time, or even de-orbiting them at will. This would solve the bane of 'kinetic' anti-satellite weaponry, such as missiles, as pulverizing something in low earth orbit just makes thousands of pieces of 'space junk' that can threaten friendly and unfriendly orbital systems alike. Finally, as system like the one described in the Phoenix Project, or another similar project, could not only disable an enemy satellite, but it could potentially commandeer it, re-purposing it against its will. This satlet deploying mission seems almost perfectly suited for the X-37B, with its pickup truck sized payload bay and reusability. Even disabling, capturing and returning to earth a small enemy satellite from orbit is really not out of the question, especially if future derivatives of the X-37B are built, ones that are larger in size with more payload capacity. The fact of the matter is that just as we have seen rapid developments in unmanned aircraft and submersible technology here on earth, low earth orbit is beginning to see similar technological effects. Just like cyber warfare, the ability to survey, intercept, jam, incapacitate or even commandeer enemy satellites represents another combat 'dimension' of the future. As the technology proliferates, it will come down to measures and countermeasures as far as whose orbital sensors will be most vulnerable from orbital attack and whose will not. Currently, the U.S. is in a very good place technologically where it can dominate this looming future battlefield. When it comes to recent Russian and Chinese efforts, coming within observation range of another orbiting object, and even maneuvering around it, is not the same as manipulating it. Additionally, America has substantial tracking capabilities for objects in orbit and Infrared and radar systems currently used for missile approach warning systems today could potentially be miniaturized and deployed on key military satellites for defense and warning purposes. Additionally, our space-based manipulation abilities are second to none, and the X-37B, or a derivative of it, may be the perfect vehicle to facilitate such a technology in the future. Yet all these technological and strategic advantages erode quickly without continued investment. When it comes to the DoD, there are a lot of rabidly competing budgetary priorities out there right now. Yet imagining the U.S. military operating during combat at even close to its potential without the virtual armada of satellites it currently depends on is not a pretty thought. Which makes such an 'asymmetric' capability an absolute dream for our enemies and potential enemies alike.